A dramatic shift in weather that’s producing an unprecedented surge in pop-up thunderstorms, superstorms, and tornados is challenging live event producers to completely re-think their approach to real-time weather forecasting. Fortunately for the live event industry this challenge comes at a time when a new generation of advanced weather detection and monitoring systems are available to help make all live events safer live events. Plan ahead when the sun is shining and not when the storm clouds roll in — that was the message delivered to the more than 200 professionals who attended March 19th, for the second Take 1 Insurance sponsored Event Safety Webinar, “Weather First: A 60-Minute Primer on Incorporating Weather Technology in Outdoor Event Safety Plans”. Hosted by New Bay Media’s Rental & Staging Systems, the Event Safety Webinar included presentations by Carroll, Event Safety Alliance (ESA) Executive Director Jim Digby, and Weather Decision Technologies (WDT) Senior Vice President David VandenHeuvel. A complete transcript of the webinar is now available for all to access at this link (click here). The webinar focused on issues such as weather planning and "predictive weather forecasting" vs. "nowcasting," or rather, the dilemma a live event producer faces when deciding whether to pull the plug due to dangerous conditions. With weather detection technology, pre-emptive insight for event producers and venues alike is now accessible. VandenHeuvel stressed that just because you are weather savvy, and live in a seemingly weather savvy region, doesn’t make you immune. And he went into detail about the need to create a 7-day event plan, Global Decision Analytics, GeoSpatial Business Intelligence, and the latest Apps that can make your staging or event company fully ready, and compliant. 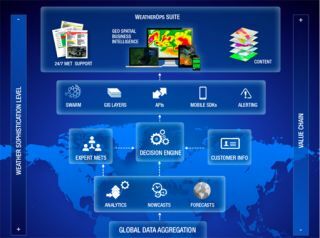 Weather Decision Technologies (wdtinc.com) provides organizations with weather decision support on a global scale. WDT offers specific expertise in large venue safety as it applies to hazardous weather detection and prediction, forecast modeling, decision analytics, GIS, mobile apps and interactive mapping. U.S. Risk‘s Take1 division (www.take1insurance.com) has been servicing the insurance needs of the film and television production industry and has expanded significantly to meet the needs of audio-video and communications industry clients as well, including a major presence in the market for insurance for live event producers and staging companies.